Posted March 31, 2019 by Brooke Shriner & filed under Online Teaching Resources. A friend of mine (also an online instructor) and I were chatting over coffee the other day. She was telling me she spends hours providing thoughtful feedback on her students’ essays, only to find out that a large proportion of them aren’t always reading that feedback (as suggested by some of the questions they ask later). I commiserated – it is heartbreaking to think that all that time we spend providing that detailed, formative feedback (the kind we know is the best kind to give in any educational modality, but particularly online) is not necessarily reciprocated by all students. Why is that? We came up with a few hypotheses over our scones and lattes. One is that, over time, students have been trained to be so grade-focused that the number remains the “feedback” students are most drawn too. They feel it tells them all they need to know. Another hypothesis is that feedback can be overwhelming sometimes, especially for students who need a lot of work. We also wondered if students might not see feedback as a communication opportunity between themselves and the instructor. Rather more of a one-way street. If student saw feedback as a two-way street, would they be more likely to read and digest the feedback? Dr. Bruce Johnson, a member of our AdjunctWorld community, wrote an article on this topic titled 4 Steps to Prompt Student Responsiveness to Your Feedback. In it, he describes some methods to encourage this two-way street. I’ll summarize a few of them here and add a couple of my own ideas for encouraging students to read feedback as well. 1) Ask thought-provoking questions in your feedback. Nothing pulls a response from students more than asking them a question. The question opens a door and, if you ask one that has them follow up on a thought, an aspect of the reading, or otherwise think critically, then you are getting what I call a “two-fer” – you are inviting students to engage with the feedback while providing an additional learning opportunity. I’ll add that sometimes a simple question or comment can encourage a student to engage in conversation with you. I might say something like “I can tell you had fun with this assignment, Mary. 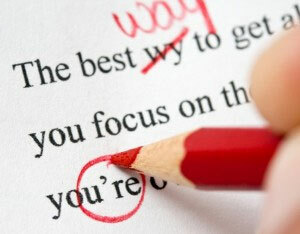 Did you?” Or, if the essay or assignment had them make a choice, comment on the choice. For instance, I often have my students apply psychological theories to a character from their favorite movie, show, or book. If I happen to also be a big fan of that movie, show, or book, I’ll say so and this often promotes comfortable conversation (as well as more openness to your feedback). In other words, if you deliver your feedback in a conversational tone, the feedback will feel like – and therefore pull – a conversation. 2) Especially if a student is really struggling, require follow-through. Tell students they will need to read the feedback for an important opportunity for follow through – one that might be necessary for the assignment’s completion. 3) Encourage students to assess their learning themselves, prior to receiving a grade. As Johnson writes, “Through the use of a non-graded activity such as a self-check, students can be encouraged to ask questions and this is likely to provide you with an opportunity to offer developmental guidance, resources, and techniques. This would also enhance the feedback provided as you can relate their response or assignment back to discussions you had about their progress in the prior self-assessment. Titrate our feedback to the developmental level of the student. If a student is obviously struggling with college level writing, choose your battles. Choose 3 or 4 concrete things they can work on between now and the next paper to improve. And then, on the next assignment, add a couple of more suggestions. This can help alleviate the sense of “feedback overload” that can be discouraging to a student who is really trying, but needs some extra help. Do you have any ideas for encouraging student review of and response to your assignment feedback? Please share by leaving a comment below!